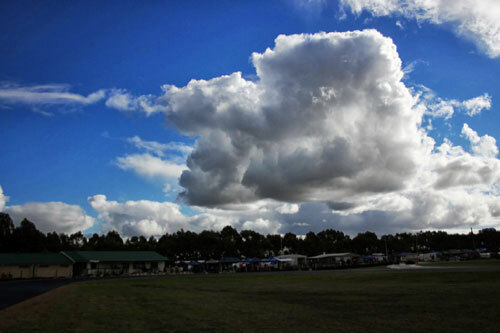 South West Kart club has staged one of the more memorable rounds of the Austrans Victorian Country Series at its Cobden Park Raceway on the weekend. For the second consecutive round, rain hampered practice and also challenged drivers on race morning. But when the green light went on, it was a fantastic weekend of racing, regardless of the conditions. 141 entries proved that the series’ move back to one day racing is a success. Over 40’s was first class up and most opted for wets in heat one, two of the guns Craig Arnett and Glenn Henley on slicks. Andrew Stubbs drove superbly to record a great win, but by the end Arnett was fast catching. Mark Cottrell took the chequer in race 2. Arnett and Cottrell brought the field to the green in the final, and Arnett would lead comfortably for most of the race. With just laps to go, the little green man, Leon Forrest challenged Arnett, and then went on to take the win. Arnett finished second, whilst Stubbs filed through for third following the late race demise of Craig Jelbart, Ron Taylor and Henley with just laps remaining. 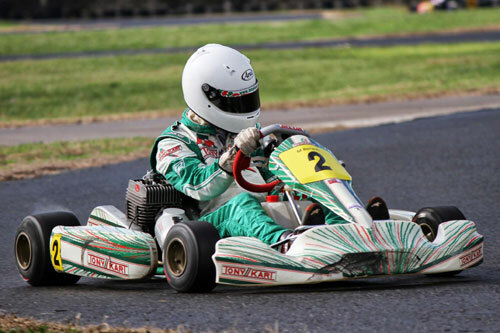 Kyle Rethus is dominating Clubman Light in this year’s series, and he was at it again on his home track. 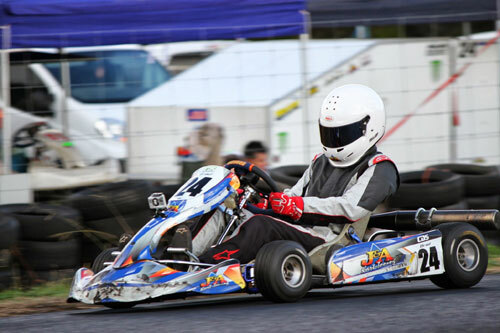 The 43 kart was untouchable in recording three wins. And every time Rethus took the chequer, it was Mav Benson following him home. In fact the class was very consistent in the heats, Luke Fong locked in third, Paul Burgess in fourth and Luke Bamford consistently fifth. Burgess and Fong would swap places in the final, Bamford completing a trio of fifths. Sean Larkin took the win in a damp opening encounter in the cadet class, most drivers choosing wet tyres. Jonathon Cassar finished second, George Gower in third. From here on in the challenge was between these three. Darcy Micallef would bump Larkin back to fourth in heat 2, won by Gower over Cassar. But when it came final time, it was Cassar who went on the rampage, collecting his third straight round win. Larkin was second ahead of pole man Gower. 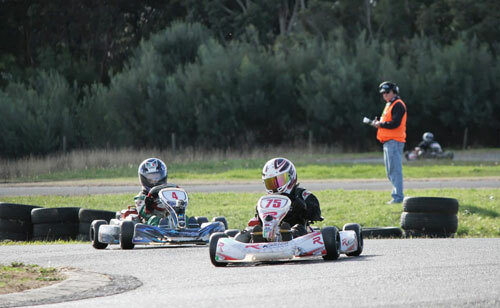 This class is being hotly contested, and many of the older drivers marvel at the skills of these youngsters, and amazingly, they recorded the same podium as Warrnambool. Brad Marsh-Stepney continued his good form from Warrnambool by taking a first up win in Junior National Heavy. SA drivers Mitch Broome and Sam Baker filled the minors. Marsh-Stepney would settle for second in heat 2, lady racer Jaymi MacKay showing her prowess to take the win, Aaron Jackson third. A shootout looked on the cards between Marsh-Stepney and MacKay, locked into the front row. But Marsh-Stepney was just too good, taking a 4 second victory. MacKay home in second, ahead of her club mate Joseph Clough, who started seventh. Three races, and three different winners in SRL. Tim McCarthy took first honours, Brock Rae the second race. Jamie Robertson filled the runner up spot in both heats, Shaun Lyness and Sam Rofe sharing the thirds. Jamie Robertson was the most consistent, but he stepped up in the one that counted, taking the round ahead of Brock Rae and Shaun Lyness, who recovered from an 11th in heat two. The fastest class and often one of the most entertaining, Tag Light would not disappoint at Cobden. Broe Shiells used his pole position to great effect in heat one, snaring a first up victory over Harley Benson and Kyle Rethus. Proving the depth in this class, Ashley Lear won heat two from Corey McCullagh and Tyler Cramer, so six drivers on the podium in the heats! Capping off a superb weekend, Ashley Lear stomped his authority on the final to win from Shiells and Rethus. Interestingly Benson, McCullagh and Cramer filled the next three positions. Series frontrunner Chris Rodda started on the front row of heat one, and turned it into a race win, the perfect way to start his day. Anthony Warner in second, headed off veteran racer Peter McDonald in third. The evenness of the class showed, John Heath a winner in heat two ahead of Court Griffiths and hard charging Barry Clough. The final was a cracker, as John Heath lead away before Barry Clough charged to the lead. As the laps went on, first Chris Rodda emerged, and then John Owen. Rodda and Clough would battle it out, and after a series of enthralling laps, Clough took the victory over Rodda and Owen, who started eighth. Tag Heavy would endure an interrupted start to their weekend after an early red flag in heat one. Contact between Daniel McKean and Leigh Bowler, would result in McKean violently rolling his kart over Bowler into turn one. Bowler suffering a minor hand injury would continue, but McKean was transported to hospital, where he was later cleared of serious injury. The rest of the class went racing in a single file restart, Daniel Rethus emerging as leader soon after. Rethus taking the win over back row starter Scott King and pole man Mark Hatton. King got his revenge in heat two, winning from Rethus and Andrew Hayes. The Portland Duo of King and Rethus headed the final grid, and would stay there until the flag. Another win for King, and a fine second on return for Rethus. Jarrod Sanfilippo held third for the majority of the final, before a last lap pass by Hayes secured the final podium position. 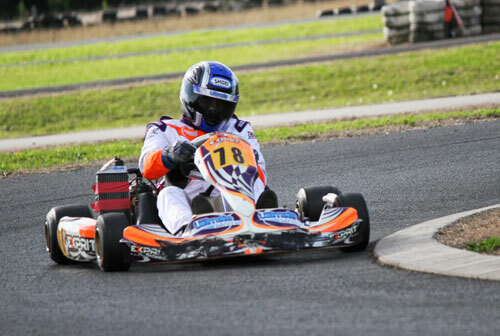 Dylan Hollis in undoubtedly one of the best young drivers in Australia, and again he showed the Junior National Light drivers what they are chasing. Hollis recorded three wins, yet again, and his dominance was undeniable. Luis Leeds joined the series, and had a great weekend recording second places in each event. Kirby Hillyer was the best of the rest in heat one, whilst his fellow SA driver Morgan Feast stepped up to fill the podium in heat two and the final. Clubman Heavy is another class that is being dominated by one driver, and that driver is Chris Thomas. He was too good again at Cobden, and despite new entries to the class, Thomas took the chequer in all three events. The only man to seriously challenge Thomas, Michael Geist recorded second and fourth places in the heats, before emerging as runner up in the final. Glenn O’Brien was consistently in the mix, third in each race. A big field of 19 Rookies took to the track, and it was Mathew Steel taking the first win, after starting 11th. Nathan Williams from 16th took second, Domenic Romeo home third from 15th. Romeo used his front start to take heat two, from Warrnambool winner Michael Clemente and Steel. After the results of the earlier events, any number of drivers could have won the final. Romeo, Steel and Josh Smith all led the final at different points, and when the race reached its climax it was an excited Romeo greeting the flag. Steel capped a solid weekend with second, Smith grabbing a fine third.